“While lots of kids received new bikes for Christmas, for my Dad (Tom Hayden), this Christmas brought a bike that certainly had the look of something new but was definitely from another era. 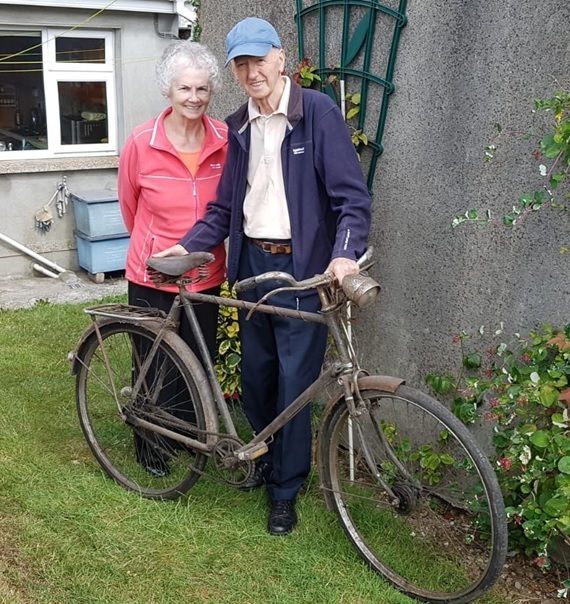 In the early 1950’s, he had purchased a second-hand Raleigh for “8 quid” from Corrigan’s Bike Shop on Mitchell Street from the late Jimmy Brett. It has been a long time since bicycles have been sold from this location…you are more likely to walk away from as it is now Ger Gavin House of Gifts. My dad took many a trip with his Raleigh over the railway bridge to work at the aluminium factory. And of course, the occasional cross-bar for my Mother (Kathleen). The task of re-furbishing the bike was undertaken after I completed a Bicycle Mechanics course at Downland Cycles just outside Canterbury in England. After completely stripping down the bike to clean and salvage as many parts as possible, putting the old bike back together involved lots of elbow grease and several new parts. Many thanks to Peter and David at Moynan’s for all their help (without which I could never have completed the task) in sourcing parts and assistance to get the bike back to its fully functional glory. Saturday: Training spin leaving from Woodies car park, Nenagh at 9am. Sunday: Club spin leaves Moynans at 9am. Route to be decided on the morning.